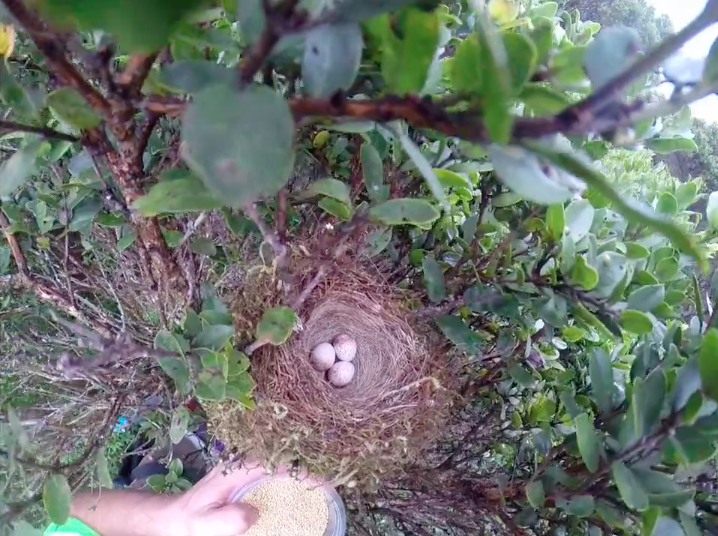 Yesterday, during a routine nest check at Halepaakai, a team from the Kauai Forest Bird Recovery Project (KFBRP) discovered an empty nest, where previously there had been two ʻakikiki eggs. The team had planned to harvest the eggs today as part of their efforts to create a captive breeding population. Dr. Lisa ‘Cali’ Crampton, the director of the KFBRP said, “With the population of ʻakikiki declining so dramatically, it’s heartbreaking to see a nest impacted like this. We think rats are the likely predators because they leave eggs fragments behind. An avian predator, like an owl, would have probably taken the whole egg. This nest was outside a rat trapping grid at Halepaakai, in an area just northwest of Mt. Waialeale.” The grid area has 150 traps. The U.S. Fish and Wildlife Service (USFWS) recently up-listed the ʻakikiki’s recovery priority to the highest level. Very few species have this designation. The KFBRP, which is administratively attached to the DLNR Division of Forestry and Wildlife works with multiple partners, including the USFWS, the University of Hawaii and San Diego Zoo Global on conservation efforts for the ʻakikiki and other threatened and endangered forest birds on Kauai. Current conservation efforts for this species include the initiation of a captive population and rat control, as well as habitat management and restoration. This time of year, during nesting season, crews travel deep into the forest, and climb 40-foot-tall ladders to remove ʻakikiki eggs from their nests. The tiny eggs are then placed in portable incubators, hiked to a landing zone and then flown to an “egg house” where they are incubated and hatched. Ultimately the tiny chicks are then transferred to one of the San Diego Zoo Global’s bird conservation centers on Maui or the Big Island. It is hoped, in time, a captive breeding population will be large enough to ensure the survival of this tiny bird in the wild.